Dugald Stewart (November 22, 1753 - June 11, 1828), was a Scottish mathematician and philosopher, and a spokesman for the Scottish school of Common Sense philosophy, founded by Thomas Reid. Rejecting the empiricism of Locke, Berkeley and Hume, Reid, and Stewart argued that good and bad moral qualities exist independently of perception; some truths, such as the fact that everything has a cause, are perceived intuitively, in the absence of proof through the application of reason. Stewart and Reid insisted that human knowledge of particular causes and effects was derived from experience and was only probable, to a degree proportional to the amount of experience. Stewart went further in asserting that truth could be arrived at through induction only in controlled experiments with scientific techniques of observation. Stewart proposed that the human psychology could be studied, not in a metaphysical way, but by applying scientific techniques similar to those used in physics. Stewart's works influenced Victor Cousin and Theodore Jouffroy in France. Together with Reid and Cousin, Dugald Stewart developed the Scottish tradition which influenced philosophy in America for half a century. 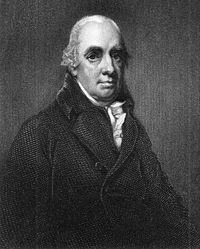 Dugald Stewart was born in Edinburgh, Scotland on November 22, 1753, the son of Matthew Stewart (1715–1785), a mathematics professor at the University of Edinburgh. He was educated in Edinburgh at the High School of Edinburgh and the University, where he read mathematics and moral philosophy under Adam Ferguson. In 1771, in hopes of gaining a Snell exhibition and proceeding to Oxford to study for the English Church, he went to the University of Glasgow, where he attended the classes of Thomas Reid. He adopted Reid’s theory of morality, which he later popularized using his admirable style and academic eloquence. In Glasgow Stewart boarded in the same house with Archibald Alison, author of the Essay on Taste, and a lasting friendship sprang up between them. After a single session in Glasgow, Dugald Stewart, at the age of 19, was summoned by his father, whose health was beginning to fail, to conduct the mathematics classes in the University of Edinburgh. After acting as his father's deputy for three years, he was elected professor of mathematics in conjunction with him in 1775. Three years later, Adam Ferguson was appointed secretary to the commissioners sent out to the American colonies, and at his urgent request Stewart lectured as his substitute. During the session 1778-1779, in addition to his mathematical work, he delivered an original course of lectures on morality. In 1783, he married Helen Bannatyne, who died in 1787, leaving an only son, Colonel Matthew Stewart. In his early years, he was influenced by Lord Monboddo, with whom he corresponded. In 1785, Stewart succeeded Ferguson in the chair of moral philosophy, which he filled for 25 years, making it a center of intellectual and moral influence. Young men from all over England, and even from the Continent and America were attracted by his reputation. Among his pupils were Sir Walter Scott, Francis Jeffrey, Henry Thomas Cockburn, Francis Homer, Sydney Smith, Henry Peter Brougham, Thomas Brown, James Mill, Sir James Mackintosh and Sir Archibald Alison. The course on moral philosophy embraced, besides ethics, lectures on political philosophy and the theory of government, and from 1800 onwards a separate course of lectures was delivered on political economy, then almost unknown as a science to the general public. Stewart's enlightened political teaching, during the reaction succeeding the French Revolution, drew upon him the undeserved suspicion that he disapproved of the constitution. Stewart spent the summers of 1788 and 1789 in France, where he met Jean Baptiste Antoine Suard, Degbrando, and Guillaume Thomas François Raynal, and learned to sympathize with the revolutionary movement. In 1790, Stewart married a Miss Cranstoun. His second wife was well-born and accomplished, and he was in the habit of submitting all of his writing to her criticism. They had a son and a daughter, but the son's death in 1809 was a severe blow to his father, and brought about his retirement from the active duties of his chair. Stewart began his writing career as a student in Glasgow, where he wrote an essay on Dreaming. In 1792, he published the first volume of the Elements of the Philosophy of the Human Mind; the second volume appeared in 1814, the third in 1827. In 1793, he printed a textbook, Outlines of Moral Philosophy, which went through many editions; and in the same year he read his account of the Life and Writings of Adam Smith before the Royal Society of Edinburgh. Similar memoirs of Robertson the historian and of Reid were later presented before the Royal Society and appear in his published works. In 1805, Stewart published pamphlets defending Mr. (afterward Sir) John Leslie against charges of unorthodoxy made by the presbytery of Edinburgh. In 1806, he received, in lieu of a pension from the government, the nominal office of the writership of the Edinburgh Gazette, with a salary of six hundred pounds. When the shock of his son's death made him unable to lecture during the session of 1809-1810, his place was taken, at his own request, by Dr. Thomas Brown, who in 1810 was appointed conjoint professor. On the death of Brown in 1820, Stewart retired from the professorship, which was conferred upon John Wilson, better known as "Christopher North." From 1809 onwards Stewart lived mainly at Kinneil House, Linhithgowshire, which was placed at his disposal by Archibald Hamilton, Ninth Duke of Hamilton. In 1810 he published the Philosophical Essays, and the first (1811) and second parts (1821) of a "Dissertation" written for the Encyclopaedia Britannica Supplement, entitled "A General View of the Progress of Metaphysical, Ethical, and Political Philosophy since the Revival of Letters." In 1822, he was struck with paralysis, but recovered sufficiently to enable him to resume his studies. In 1827 he published the third volume of the Elements, and in 1828, a few weeks before his death, The Philosophy of the Active and Moral Powers. 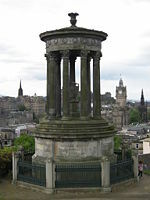 He died in Edinburgh, where a monument to his memory was erected on Calton Hill. Stewart Dugald belongs to the current of British philosophy which was especially impacted by the Scottish school of Common Sense, founded by Thomas Reid. The British philosophical movement led by Locke, Berkeley, and Hume challenged the rationalism of Descartes and developed empiricism (from the Greek word “empeiria” meaning “experience”), a position on epistemology, that all knowledge is derived from experience. Thomas Reid has been treated with indifference in the history of philosophy, and has only recently been recognized as an important figure in the modern analytical thought. Thomas Reid and David Hume were both born in Scotland and were active at the same time. At first Reid was an indoctrinated adherent of the Irish idealist, George Berkeley (1685-1753). Reid studied and finally rejected the thought of Locke, Berkeley and Hume, asserting that their theory of ideas was not backed up by evidence. He also asserted that it failed to accomplish the purpose for which it was developed, because it did not address, in principle, the question of the accuracy of perception. Reid insisted that Hume’s “Treatise” had drowned all in one universal deluge. The main problem was the concept of “hypothesis.” Reid refuted the term “hypothesis” with all his energy, while protecting the fundamental conceptual system of common sense against what he regarded as the eroding skepticism of Hume. Dugald Stewart followed Reid in insisting that any thought which conflicts with the principles of common sense must be untrue. Stewart went further in setting the prerequisite that a philosophical thesis must not vary the meanings of concepts as they were understood in everyday life. Stewart recognized in detail the epistemic resemblances between Reid and Immanuel Kant; however he chose Reid because he wanted to keep away from Kant’s differentiation between phenomena and noumena. Stewart supported Reid’s theories of the principles of common sense, but he considered the terminology “common sense” as too uncertain and leading to misapprehension. He admitted the idea of principles, but he thought the word “principles” tended to mislead because we cannot make any judgments or inferences from them which will amplify human knowledge. Stewart rejected Reid’s realistic conception of universals and supplied his own nominalistic option. Stewart and Reid insisted that human knowledge of particular causes and effects (principles) was derived from experience and was only probable, to a degree proportional to the amount of experience. Stewart went further in asserting that truth could be arrived at through induction only in controlled experiments using scientific techniques of observation. Stewart proposed that the human psychology could be studied, not in a metaphysical way, but by applying scientific techniques, similar to those used in physics, to the facts which we can discover in the human conscience. It is obvious that Stewart tried to be more careful than Reid; however basic points of his theory clearly come from Reid. In 1785, the common sense movement experienced a turning-point with the publication of Reid’s first essays and the fourth edition of Inquiry. Stewart Dugald began to lecture about Reid’s theory at the University of Edinburgh. By the 1790s the Reid-Stewart analytical method of psychology, epistemology and metaphysics, which used ordinary experience as its starting point, dominated in Scottish intellectual communities. Stewart’s works influenced Victor Cousin and Theodore Jouffroy in France. The Scottish tradition of Reid, Cousin, and Stewart developed the Scottish tradition which influenced philosophy in America for half a century. Stewart's philosophical views upheld Reid's psychological method and expounded the "common-sense" doctrine, which was attacked by the two Mills. Unconsciously, however, he fell away from the pure Scottish tradition and made concessions both to moderate empiricism and to the French ideologists (Pierre Laromiguière, Pierre Jean George Cabanis, and Destutt de Tracy). It is important to notice the energy of his declaration against the argument of ontology, and also against Condillac's sensationalism. Kant, he confessed, he could not understand. Perhaps his most valuable and original work is his theory of taste, developed in the Philosophical Essays. His reputation rests more on his inspiring eloquence and the beauty of his style than on original work. Stewart's works were edited in eleven volumes (1854-1858) by Sir William Hamilton and completed with a memoir by John Veitch. Matthew Stewart (his eldest son) wrote a life in Annual Biography and Obituary (1829), republished privately in 1838. This page was last modified on 6 October 2017, at 16:53.